The MetKids collection in the Metropolitan Museum catalog offers your kids a world of imagination and art. Art and design sets - Give your children a chance to experience art for themselves with hands-on art toys for kids. From an easel to an auto design set, choose the supplies that bring out the best in your young artist. Fun games for kids - The Met believes in the power of imagination; games for kids that inspire creative thinking are an important part of their toy collection. From an Egyptian Senet game table to other fun games for kids, they have games your kids will love to play. Building sets and construction toys - Nothing inspires children to try new ideas quite like building sets. For generations, they have been the most popular toys for gifted kids who are ready to create their own cities or design a dream house. 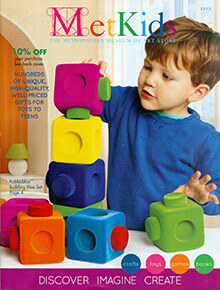 MetKids' building and construction toys make the perfect imagination games for kids of any age. Challenging jigsaw puzzles for kids - MetKids knows that childrens puzzles should be colorful, challenging and inspiring. That's why they've gathered the best in fine art-inspired jigsaw puzzles for kids, featuring everything from the works of Van Gogh to images of ancient Rome. Art books for children - It's never too soon to introduce your children to the magic of art. That's why MetKids offers art books for all ages, beginning with sturdy board books for toddlers and preschoolers. Their special museum publications and discovery books will inform and inspire older children and parents alike. Whether you're looking for unique Christmas gifts for kids, an inspiring art set, or challenging children's puzzle games, they have the toys that will keep your kids learning and creating every day.